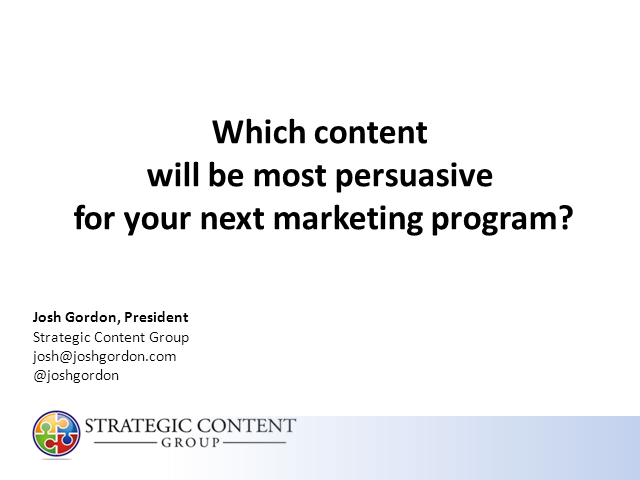 Which content will be most persuasive for your next marketing program? · Do current customers and non-customers view content differently? · How persuasive is educational content versus promotional content? · How persuasive is new product information? · How persuasive are customer user stories? · How important is content that makes direct product comparisons? Upon completion of this webinar attendees will have an understanding of how the persuasiveness of content is changing with the growth of digital communications. Josh Gordon is the President of The Strategic Content Group, which implements marketing services that empower salespeople to win. The company provides strategic tools, such as sales lead generation, persuasive content, training, and strategy that enable sales people to win. Our research based approach helps clients better understand their customers, and with improved customer understanding come better results. Gordon is author of four books on selling and persuasion, including “Presentations That Change Minds,” a Sales Book Award gold medal winner. He has been covered on CNN, CNBC, National Public Radio, The Fortune Business Report, and Wall Street Journal TV. His books have been translated for publication in Germany, China, Korea, and Taiwan. Title: Which content will be most persuasive for your next marketing program?